Need a little luck? Stitch a lucky embroidery pattern and good fortune might just find you! This collection of designs includes classic symbols of good luck, from four leaf clovers to horseshoes and ladybugs. And best of all, most of them are free. Embroider your own lucky charm, give a little luck to a friend, or wear your luck in the form of a t-shirt or pin. No matter where you choose to stitch one of these patterns, a bit of serendipity is on its way! Who doesn't want a little luck on their side? With this clever embroidery project from Jessica Marquez, you can wear some luck on the side of your t-shirt! Choose from two free patterns with different styles of lettering, and then stitch one on a tee to create what might become your new favorite piece of clothing. There are lots of symbols of good luck, and a wishbone is one of them. Tusk + Twine takes this simple object and surrounds it with embroidered foliage for a stunning pattern that might just bring you luck. 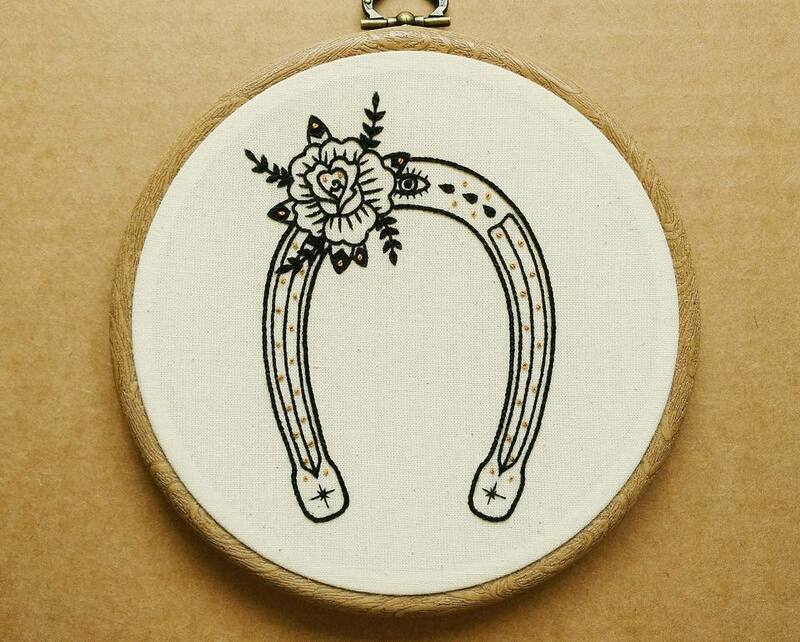 Make your own lucky charm with this easy embroidery project! Select from the lucky 7 free mini patterns. They stitch up quick, so you won't have to work for long. Then sew them into a tiny cushion to keep in your pocket, hang on your keys, or attach to a zipper! Amy from Ameroonie Designs created this Lucky pattern as a St. Patricks' Day decoration, but you can stitch some luck any time of the year. It's perfect in a frame like this, but it would also make a great patch or pin if you shrink it down a little. Who do you know who might want to wear a little luck? This sweet little girl with her lucky ladybug friend would be so cute stitched on a little girl's dress or even as hoop art for a child's room. Of course, Amy at Nana Company has lots of wonderful project ideas too, so you have plenty of options for ways to use this free pattern. While this pattern isn't your typical "lucky" pattern, the title is Lucky Fish and it does include a few fish motifs. The complete alphabet gives you the opportunity to practice a number of isolated stitches, such as fly stitch, detached chain stitch, and more. Use it to make one big sampler or pull out the patterns each time you need to spell out a little luck for yourself! Want to celebrate St. Patricks's Day in the cutest way possible? Or maybe you'd like to show off that you have the luck o' the Irish? Pull out your green threads because this collection of free kawaii patterns is for you! These designs have sweet smiling faces, making them perfect for kids of all ages. This lucky horseshoe pattern from ALIFERA is truly beautiful. Worked in black and gold, it's reminiscent of tattoo art, complete with a rose. Hang this embroidery on your wall to bring your house good luck or stitch it on a bag to carry it with you wherever you go. A Chinese lucky cat is a classic symbol of good fortune and this stitched version is as cute as can be! The free pattern works on its own, but it's also just the right size for making a sweet stuffed animal friend. Designer Jacque Davis includes simple instructions for stitching and sewing the toy. Part of a block of the month embroidered quilt series, this free pattern by Victoria Findlay Wolfe is a great spring stitching project. You can find the pattern, along with 11 others, at the Aurifil blog. Based on a song from the film "Singing in the Rain," this free pattern lets you tell someone that they're your lucky star. It would make an adorable baby shower gift or a hoop to give your special someone.